As the observant among you will have realised, my name is Leigh Perry. I am a photographic artist based in Sydney, Australia. Perhaps photographer would be easier. I try to shoot the world to show how I respond to it. My photography identifies recurring themes and motifs, usually in the context of transitions and contrasts. These may be transitions in space, such as from water to sky, or temporal transitions in the form of light and atmospheric changes. My compositions emphasise formal, often geometric, viewpoints, designed to focus attention on both the similarities between apparently disparate scenes as well as their more manifest differences. A wooden, large format Ebony 45SU is my primary camera (formerly it was an Ebony SW45, a more compact version of the same camera). The camera can be awkward to use, but it yields incomparable results when the conditions are favourable. When things aren't working in your favour, using the camera can be an exercise in frustration. 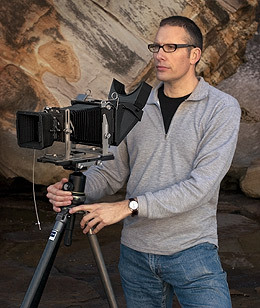 These are the rewards and pitfalls of large format photography. I hope you enjoy the photographs in the online galleries. You can email me if you have any comments or questions.